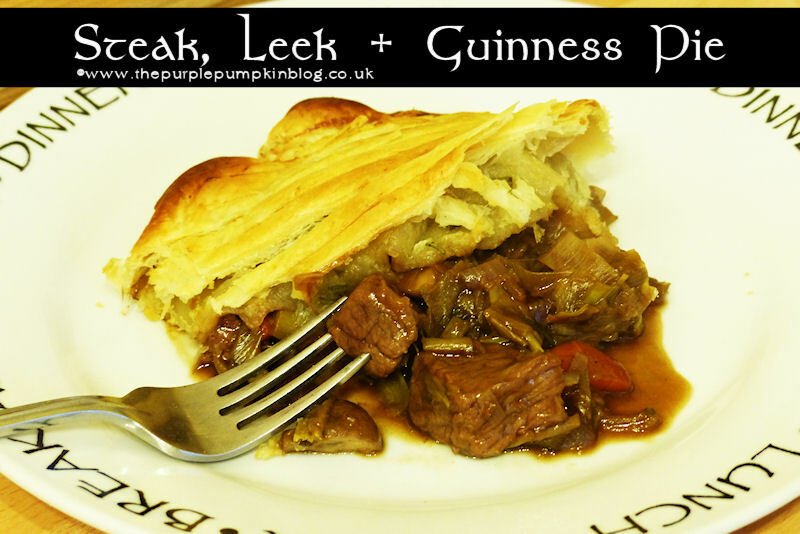 Over the weekend I made this Steak, Leek + Guinness Pie and it would make a great dish for St. Patrick’s Day. The filling takes a couple of hours to stew, but the flavour is worth it – the pie went down really well with the family! Add one tablespoon of olive oil to a saucepan and gently sweat the leeks, onions and carrots for about 10 minutes. Add some salt, pepper and a pinch of rosemary to your personal tastes. Add the mushrooms and cook for a further 5 minutes. Remove the vegetables from the pan. Sprinkle the flour over the stewing steak. Add the other tablespoon of olive oil to the same pan and turn up the heat. When hot, sear the steak until brown on all sides. Add the vegetables back to the pan and stir together. Pour in the Guinness and stir in the gravy granules. Bring to a boil and then reduce the heat to very low to simmer. Place a lid on the pan and leave to stew for 1½ to 2 hours, stirring occasionally. If you find that the liquid is running out, add some more Guinness! When the meat is tender, pour the pie filling into a sieve over a bowl to save the gravy. You can thicken the gravy if you wish/if it’s needed using some gravy granules. Prepare the pastry by unrolling it (if buying ready rolled) sprinkle over some chopped rosemary and fold in half. Roll together to press the rosemary into the pastry and to the size of your pie dish. Place the pastry on top of the filling and ‘tuck’ the sides in and around it. Score some lines across the pastry and brush with the milk. Place in a hot oven – 200C/Gas 6 for 20-30 minutes until the pastry is risen and golden. Serve with mashed potatoes, peas and the reserved gravy. I have never made a pie this looks delicious. Hope he enjoys it! Let me know how you got on with the recipe! Delicious! I can almost smell it! :D If only we had smell-o-vision! Helps to pad the pie out – at least, that was my reasoning! Yum, yum! That looks delicious, my kind of meal! Tasted better than I thought it would – I’m never sure when I start making up recipes as I go along lol! Ooh, hope you give it a try – we loved it! Om nom nom nom! Guinness is one of my faves and you can’t beat a good pie. So hungry now! Steak and beer – where can you go wrong lol! Sound really tasty, I am sure all my boys would love something like that! 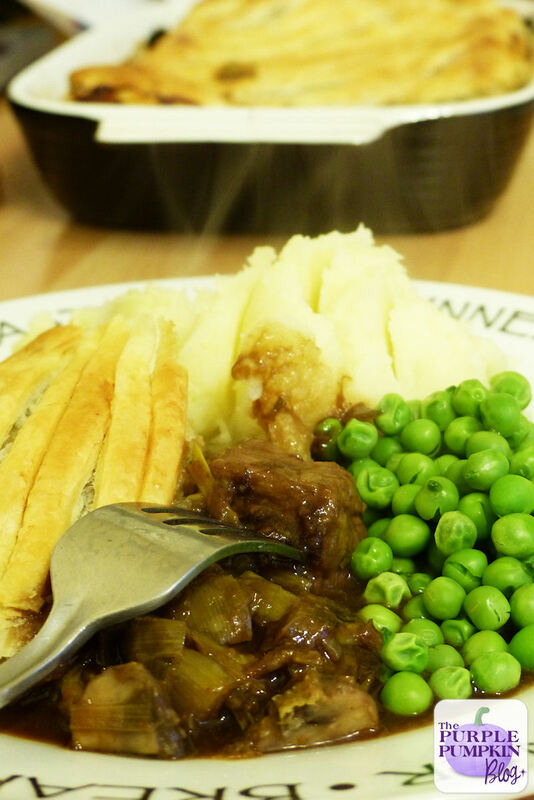 I make a veggie pie very similar to this using quorn steak strips- yummy! Ooh, sounds great – didn’t know Quorn did steak strips! That looks delicious! I’m still trying to find the elusive Genius gluten free pastry I’ve seen advertised so I can get pie making! Oh my goodness, looks divine, I am sure it will not look as good if I made it! It would taste lush though! Trust me!